Rewards are still going out. It is a slow process; I am the only one who is working on this, and I can only do so many at a time because of available time and resources. They all will get out, but it will take some time. I do have a larger session scheduled in June when I have some help for a few days, so hopefully more packages will get out then. It is also difficult because we are not generating any income as a game company, and shipping costs have risen to exorbitant amounts, especially for international shipping. So, again, your items will arrive – but it will take some time. If you need to update your address, or have any other concerns, you can write me at info@infamous-quests.com for more information. Bottom line is, I am working on it. 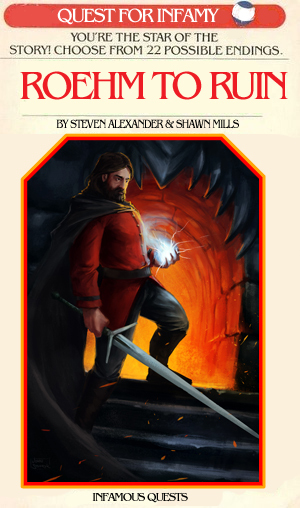 Yes, in my spare time I am also working on completing both Roehm to Ruin and Order of the Thorne: Fortress of Fire. No, I am not making any money or getting paid to do this – I’m doing it because I enjoy it. But my free time is very limited now. Thank you. We are nearing the end of production on Quest for Infamy: Roehm to Ruin! We’ll announce the official date in the coming weeks, but soon you’ll be able to play this prequel to the award winning Quest for Infamy! In Roehm to Ruin, find out what happened that fateful night in the Baron’s castle… find out the whole reason for Mr. Roehm escaping and running away to The Valley of Krasna! Sneak through town and crash the highly posh party in the castle! Steal anything in sight! Discover the mysteries of the Baron’s Castle! See how much mayhem and mischief Mr. Roehm can have in just one night! It’s all in Roehm to Ruin. Our games are on sale at Humble Bundle until next Sunday! You can get both Quest for Infamy and Order of the Thorne on sale for 50% off. Each game comes with a STEAM key, so you can add our games to your library. Click on the Images Below to go to the Store Page to Order!! COUPON CODE FOR QFI COMPANION: Enter “TWODOLLARS” as a discount code to get the QFI Companion for $1.99! Humble Bundle is having a sale, and Infamous Quests games are invited! 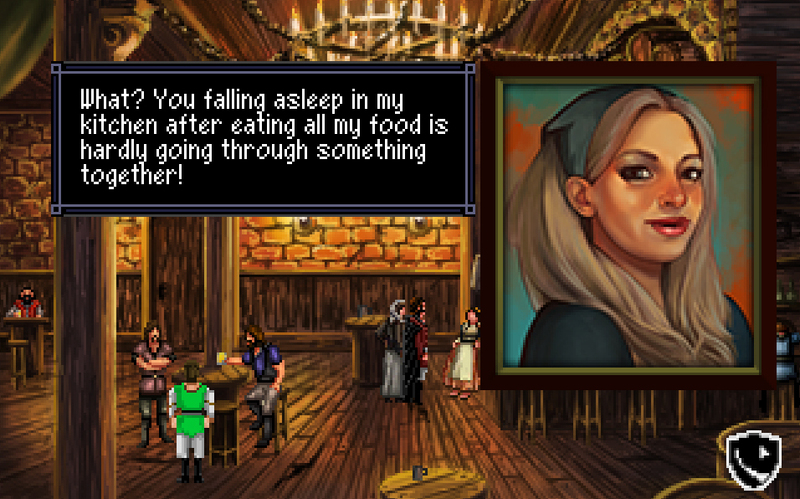 You can get both Quest for Infamy and Order of the Thorne on sale for up to 80% off! That’s $1.99 for QFI and $2.49 USD for Order of the Thorne!! You can get the games AND a Big Mac this week! If you haven’t picked up our games, or know someone who hasn’t yet – now is the time to get them! We’ve got amazing deals for Cyber Monday, and now you can get our games on sale at these various platforms! Prices up to 90% off! 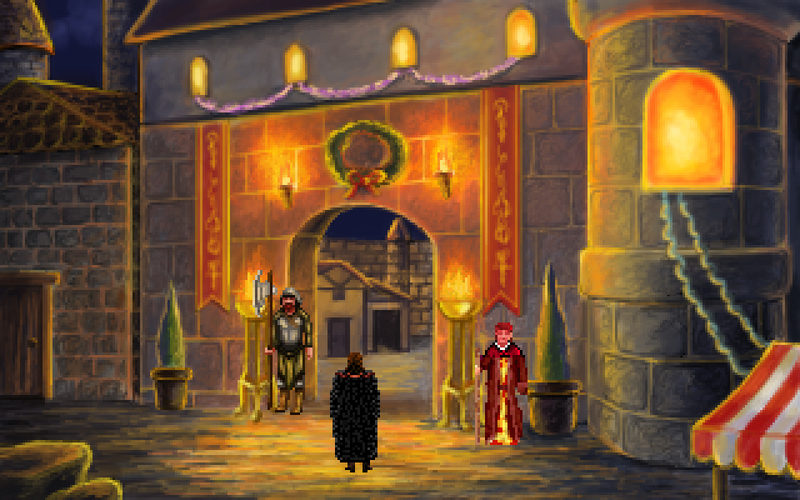 An award winning point & click role-playing adventure game. We’re just crazy for Stranger Things on Netflix; so Jon Taylor-Stoll, James Mulvale and Steven Alexander made a little one-room tribute game based on it! You can check out our tribute to “Stranger Things” right here! If you haven’t seen the Netflix show yet, you should really do yourself a favor and watch it! Anyway, here’s our little one-room game, have fun, explore and watch out for things that go bump in the night. And even a thumbs up from Chief Hopper himself! I know it’s been a long time between updates; I want to apologize for that, but I didn’t want to post something when I had nothing to report. Due to some professional and person setbacks/issues, there’s been delays on my end with some of the shipping. I’d sent out some packages earlier in the year, and a few more in sporadic doses in between, but I still have a vast majority of packages to send out. I’m very sorry about the delay. I don’t want to give long explanations, but I do want to apologize and let you know I have been working on packing them up, and now – this week – I intend to send out even more. Everyone should be getting their packages between now and the end of Summer (Mid-September). This is just a small taste of packages waiting to go out. For several of you with larger packages and multiple items, I will contact you personally when they go out, so you can know to look for them. Again, I have to apologize – this has been a source of great anxiety and stress to me, and I feel awful about the delays. You all have been amazing and supportive, and I can not thank you enough for that. We’ve had a great run as adventure game designers; from our ambitious start as Infamous Adventures and our remakes of King’s Quest III in 2006 and Space Quest 2 in 2011, to our latest games – it has been one of the greatest adventures of my life. I’ve met and made friends all around the globe; I’ve traveled, told my stories, worked with amazingly talented people and done things I only dreamed about as a kid. I never thought in my life I’d be able to accomplish so much, and yet – we did. In 2012, we banded together – the creators and the backers – to fund our project on Kickstarter, and it was a magical time, not only for us, but for other creators and fans. It was, simply put, a magical time. Something I don’t think will ever be repeated in the history of game creation and gaming culture. I have to thank you all for being a part of that and including us in it. After the completion and releases of our upcoming games, Order of the Thorne: Fortress of Fire and Quest for Infamy: Roehm to Ruin, we will most likely not be producing any more games. Adventure games, and certainly the kinds of games we produce, are a niche market. Niche is probably a fancy and nice way to put it… we’re a tiny segment of a huge and amazingly competitive market. We’ve been lucky enough to create the kind of games we always wanted to make and play, but – unfortunately – it hasn’t been financially viable for us to do so. We just haven’t been able to sell enough copies to cover our production costs, and I can’t pay the talented people who make these games come to life in good wishes and moral victories. They deserve more. Like many commercial ventures, I’ve incurred a decent amount of personal debt on this – I rolled the dice, and sadly, it didn’t quite pan out. It’s not viable for us to continue on, from a financial standpoint. So, we will complete our last two games here, and continue on – many of the people who have worked on these games are already involved in other careers, jobs and projects, and are committed to finishing our games solely because of our love for the games, the genre and you, the fans. You backers have been the best – I wish there was a whole lot more like you out there. Thank you so much for everything over the past four years – you were, and are, the heart and soul of everything we’ve ever done. Being a designer has been amazing, and you all have afforded me and my friends to collaborate to tell you our stories. 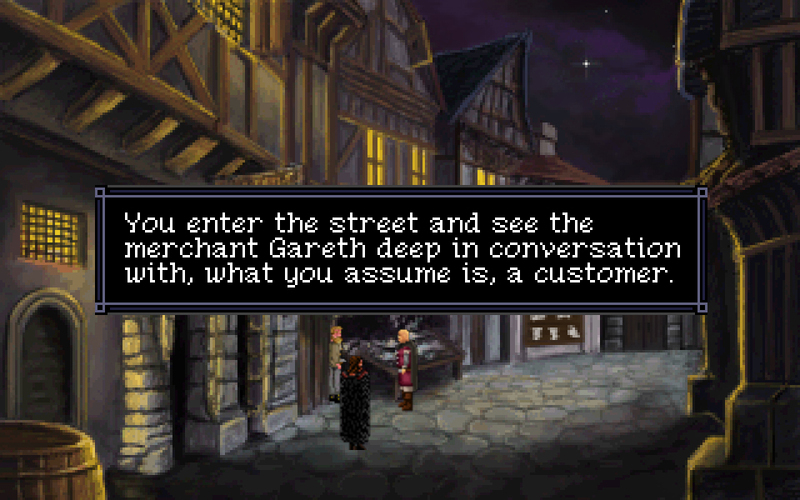 Thank you for letting Mr. Roehm come to life, and for letting him pursue a Quest for Infamy. There was a time when QFI was just a pipe dream of some post-college kids – and you made it a reality. I wish you all the best in the future, and (again) thank you. Thank you, thank you, thank you. We hope you’ll enjoy our upcoming games – even though they are most likely the last, I’m very excited about what they’ll offer you, as adventure game fans. Orders have been placed, all the “t’s” have been crossed and the lower case “j’s” dotted – the physical items for Quest For Infamy will be completed and delivered to us for processing by Friday, May 22nd. This means the first wave of packages with boxes, DVDs, etc – will be sent out to backers shortly after that. Packages will continue to go out until they’re all delivered! 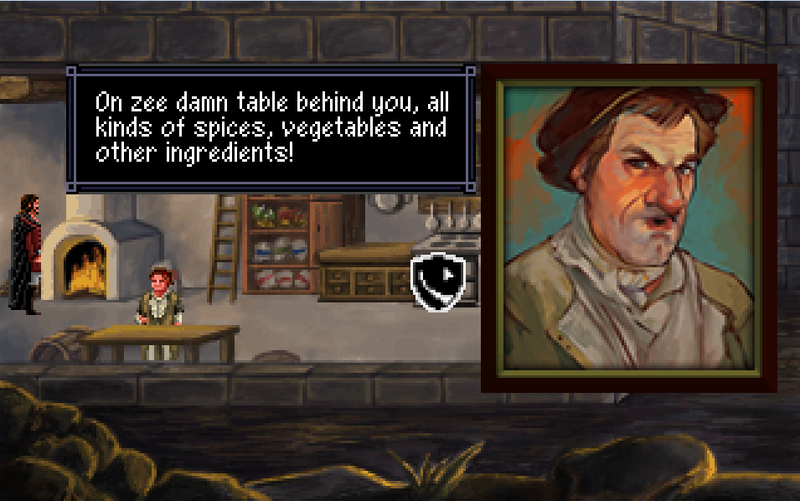 This puts a final pin in this whole adventure with Quest For Infamy. It’s actually an amazing cap on this journey for us. We learned so much, as a team and as a company, about working together and making a game. 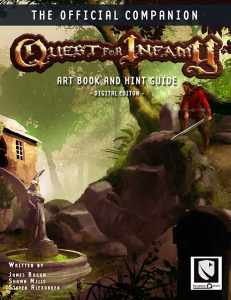 We’re really proud of Quest For Infamy; though it hasn’t been a runaway best seller, it’s been bestowed with some critical praise we’re really happy about – IndieDB’s Top 100 Indie Games of 2014, TIME’s 20 games to watch out for Summer 2014 and recently, we won four AGS awards – Best Gameplay, Best Character, Best Puzzles and Best Music & Sound. We couldn’t have done this without you all. I really can’t say enough thanks about that – what a crazy time it was in mid 2012 when we launched this. The excitement about the whole adventure game revival scene was palpable and we were psyched to be a part of it. It’s been interesting, seeing the progress of the whole scene, and on the whole – I do feel that adventure games and their fans are “back” (As if we EVER went anywhere…) and this has probably been one of the most exciting and fulfilling things I have ever done. We’re continuing on at Infamous Quests! You have seen our announcements about our upcoming games – The Order Of The Thorne: The King’s Challenge and QFI: Roehm to Ruin. We’re continuing to make games – and we have more planned beyond those two as well! We’re going to be launching a Kickstarter to help us raise the funds needed to finish these two games. We’ve been working on them for a while, and they’re quite close to being finished – but we need some additional funds to help finish them properly and in a faster manner. With a successful crowdfunding campaign, we aim to have these games completed, released and available on Steam, GoG.com, Humble and Desura by November 2015. If you’re interested in supporting us on that campaign, and would like to see a preview of the campaign, let me know and I’d be happy to share it with you. Many of you are now close friends & confidants and I value your opinions. We’re all abuzz over at Infamous Quests; the art and music team are chomping at the bit to get going on this again. They’ve been working up more sketches, assets and lists to prep for this – and the atmosphere is much like early 2012, when we spent the first half of the year working on the Infamy Demo. They’re ready to go. I’m excited to not only work out the games, but to get out all this awesome QFI swag – I think it’s all really cool, and I’m just excited for you to have it in your collections. I hope that the swag remains a cherished piece of your home for years to come. I know I look at my old Sierra boxes, and I think about the time when I bought them. Who I was, where I was… the thought of people all over the world looking at that Quest For Infamy box on their shelf and remembering how they helped make a game… that’s pretty indescribable. I know when I look at my shelf for years to come, I’ll remember everything… how I got to work with my friends, and how I made new friends, and we all made a dream come true. Someday, when I’m old, ornery and crusty (even more than I am today), I want to look at that box, and remember the time when me, and 1,700 friends made that game. Thank you all. My best wishes to everyone – this was something very special and personal to me, and there’s a part of me that can’t believe it’s over. Onward and upward. Let me start off this blog post with an admission. Although the passing of Leonard Nimoy isn’t exactly adventure game related, it is something I feel some emotion about because his death this morning brought to mind my formative years and the inspirations I have which led me to a career in making adventure games. I have a vivid memory of Star Trek being rerun on television during my summer school holidays every year, and my father asking me to record them for him. It must have been 1986 or 1987 I suppose. So my first experience with Leonard Nimoy was watching Star Trek while sitting in the Australian summer while my brothers played outside, dutifully recording it without the adverts for my dad, on our VHS with the remote which ran on a 10 meter cable instead of the later infrared versions. I lucked in I suppose in watching Star Trek is that the first episode I watched was the Corbonite Maneuver which remains one of my favorites to this day, and the second episode I watched being City on the Edge of Forever. They didn’t bother playing things in order on our local TV station back then. One last thought, I still can’t decide whether Star Trek 2 or Star Trek 6 is the best classic Trek movie. But the scene between Kirk and Spock in Kirk’s quarters where they discuss their age is my firm favorite scene. “Is it possible that we two, you and I, have grown so old and so inflexible that we have outlived our usefulness?” I love that it feels like Shatner and Nimoy talking, knowing the The Next Generation was proving to be popular. It’s hard to put into words why his passing means something to me, yet it does. Star Trek was a massive part of my early teenage years and Mr Spock is a massive part of Star Trek. I suppose that’s all that matters in the end, that it DOES mean something. LLAP. Our message boards are now enabled with Tapatalk. This is an app that is free to download from most mobile platforms that transforms our forums into a social hub. Any topics and posts can be easily read and replied too and you can receive notifications straight to your phone whether you receive a direct message or quoted in a post. You can find out more by heading over to www.tapatalk.com.If you’re already signed up with Tapatalk than all you need to do is make sure your account email address matches your forum profile email and once you’ve found us you can start connecting and getting involved on the go. Or at home, it’s your phone. And we want to remind everyone we do have backers’ private forums available with exclusive content and sneak peeks. If you backed Quest for Infamy you can register to our forums and we’ll give you access. I’m sure you wouldn’t want to miss out.